Yesterday, I went for lunch at a Thai restaurant in Silom road, and they served customers complimentary Miang Kam. I was very happy because I haven’t had Miang Kam for a very long time. I used to eat it a lot when I was a kid. เมี่ยงคำ Miang Kam is a traditional Thai snack. In the old times it was served only among members of the royal family. 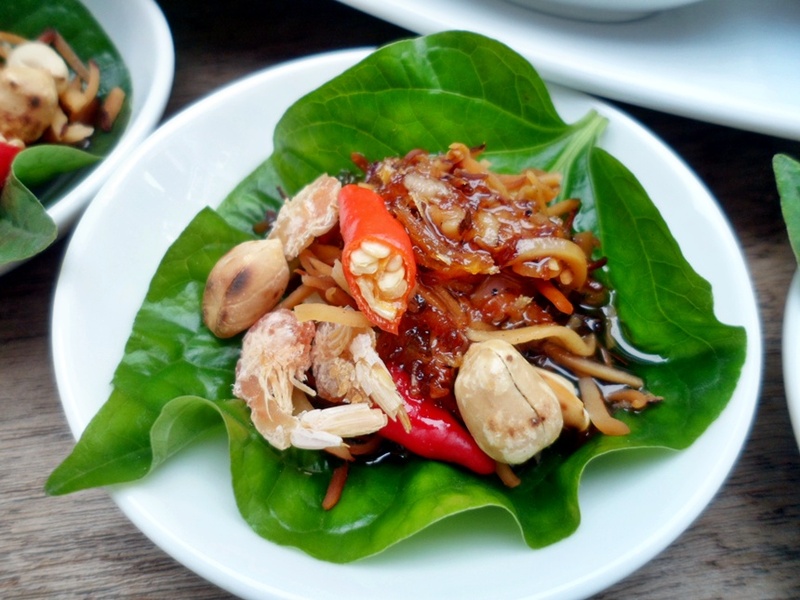 The reason was that the ingredients for Miang Kam had to be delicately prepared – ginger had to be equally cut into a dice , shallots to be finely thin sliced, lime to be cut into small squares with a very thin peel, and dried shrimps selected the same size. These days you can easily find Miang Kam from street vendors. 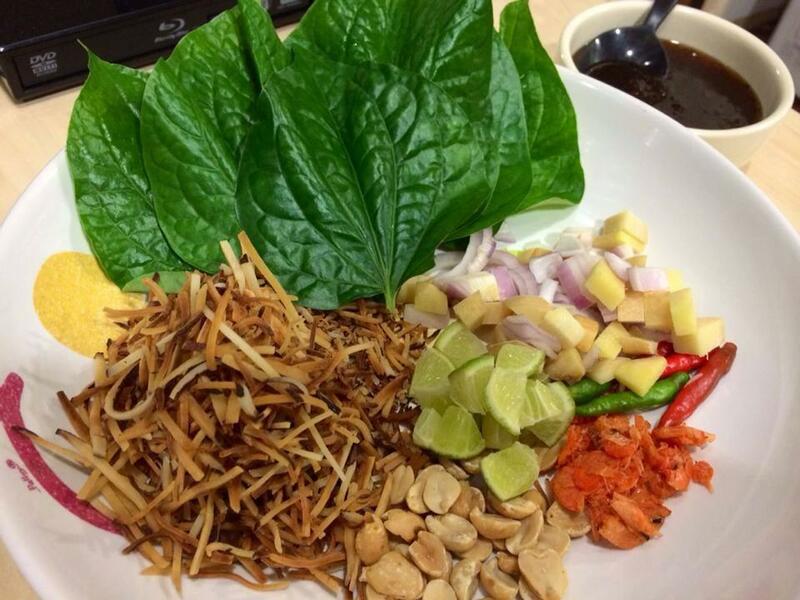 Miang Kam can be eaten all the time, but it is most popular during the rainy season because there are a lot of young leaves (ใบชะพลู piperaceae leaves) that are most tasty and delicious. These leaves have very high nutritional value. It helps your digestion, and the leaves are full of vitamin C, iron and calcium. Fillings are: roasted grated coconut, finely diced ginger, finely diced shallots, unsalted roasted peanuts, small dried shrimps, finely diced lime, and chopped green bird’s-eye chilies. Sauce is made from shrimp paste, shallots, galangal, ginger, grated coconut, unsalted peanuts, and palm sugar. Take a leaf and place a small amount of each of the filling ingredients in the middle, top with a spoonful of sauce, and fold up into a little package. Pop the package into your mouth and enjoy the fresh, springy taste. Ahh.. I think I have to go and get more Miang Kam today. 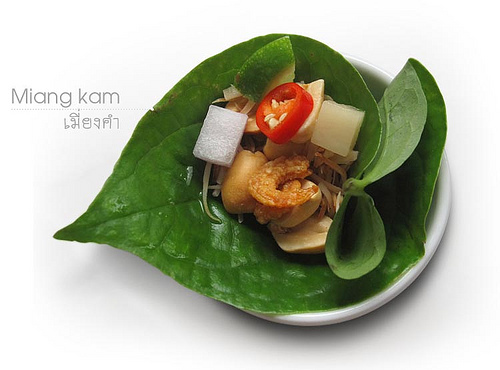 Have you tried Miang Kam before? How do you like it? I knew straight away what the snack was because I enjoy it so much. At The Gallery restaurant in Chiang Mai on the banks of the Ping river they have Miang Kam as a starter – delicious. At many of the talerts around Chiang Mai you can buy take away ( flap ban) packs of Miang Kam for about 20 baht with all the ingredients served on a foam tray and covered with Glad wrap. 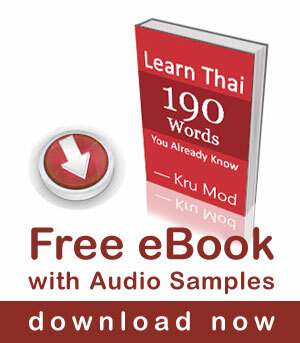 Hi Mod – I love Miang Kam. In fact, it’s my favorite Thai snack and I was able to get it on the menu at our Thai restaurant in Miami, Florida. If you ever visit Miami, you are invited! We have friends who own a farm here that grows all the ingredients for local Thai restaurants, and they supply the ใบชะพลู. Next week I will travel with friends to Bangkok from the U.S.. Do you have any suggestions of good places to enjoy Miang Kam while we are there? Most authentic? Most fun? I know you can find it many places but I was wondering if you had a particularly good experience someplace. Thank you for your posts and your knowledge sharing. You’re doing a great job!